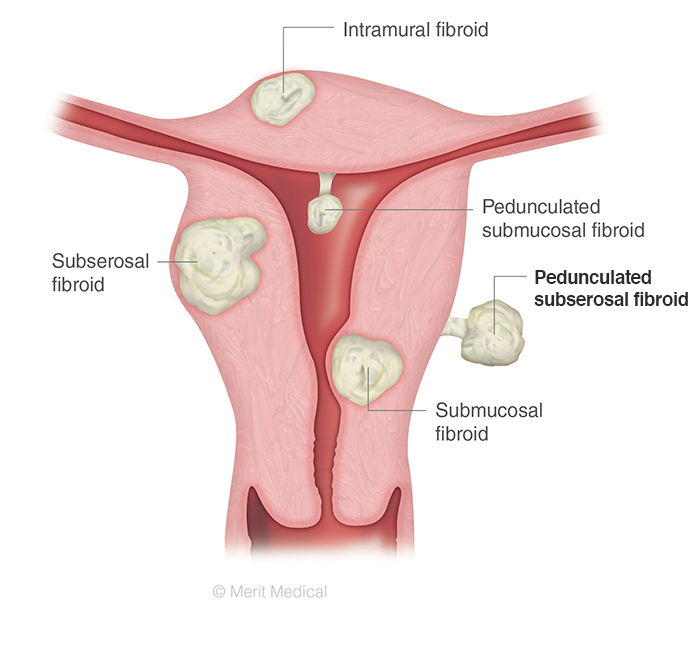 Can UFE Treat Pedunculated Subserosal Fibroids? Uterine fibroid embolization (UFE) is a well-established, minimally invasive fibroid treatment that’s recommended for select women who want to retain their uterus. Improving -related symptoms in 85%­­­­­–90% of women treated, UFE targets fibroids of different sizes and locations in the uterus, relieving symptoms like heavy periods, pelvic pain, and urinary dysfunction.1 Watch a helpful video about how the UFE procedure works. The 9-year study enrolled 55 women with PS fibroids who underwent UFE.5 Researchers labeled each PS fibroid by risk, depending on the thickness of the fibroid stalk: High-risk PS fibroids have thinner stalks, whereas low-risk PS fibroids have thicker stalks. Three months following UFE, the women had MRIs to measure how well the procedure worked. Any complications were also noted. Results showed that over 96% of the women experienced symptom improvement.5 Minor complications occurred in three women and included fibroid expulsion—or the passing of fibroids from the body—and temporary pelvic pain. None of the women had major complications related to PS fibroids. Because this study had a relatively short follow-up period of 3 months, “the university maintains a website where patients can report complications over the long term. However, the researchers note that complications related to PS fibroids haven’t been reported. Braude, P., Reidy, J., Nott, V., et al. (2000). Embolization of uterine leiomyomata: Current concepts in management. Hum Reprod Update, Nov-Dec;6(6):603–608. Tropeano, G., Amoroso, S., Di Stasi, C., et al. (2014). Incidence and predictive factors for complications after uterine leiomyoma embolization. Hum Reprod, Sep;29(9):1918–1924. Ravina, J., Aymard, A., Ciraru-Vigneron, N., et al. (1998). Embolisation artérielle particulaire: Un nouveau traitement des hémorragies des léiomyomes utérins. Presse Med, 27(9):299–303. Kim, Y. S., Han, K., Kim, M. D., et al. (2018). Uterine artery embolization for pedunculated subserosal leiomyomas: Evidence of safety and efficacy. J Vasc Interv Radol, Apr;29(4):497-501.